How do I switch from one fund to a fund of another company? 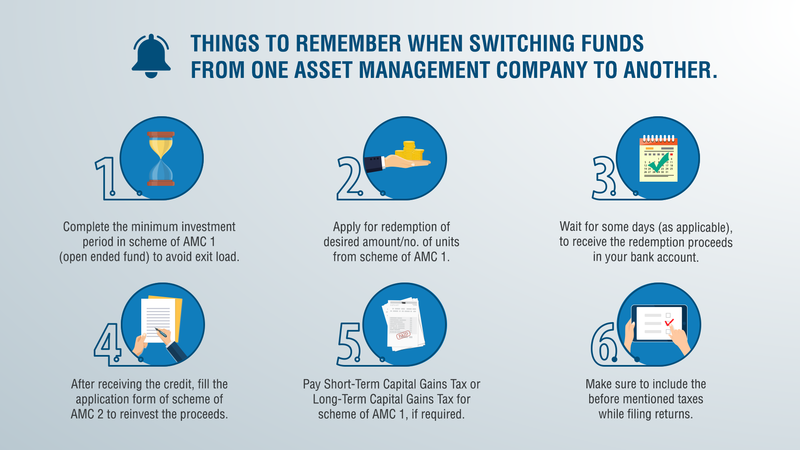 Investors switch their investment from one open ended scheme to another within the same fund house for better financial planning. To switch within the same fund house, fill up a switch form specifying the amount/no. of units to be switched from the source scheme and name of the destination scheme. You must fulfill the minimum investment amount criteria for both switch-in and switch-out schemes. There may be implications of exit-load and capital gains tax while switching. For a switch within the same fund house there’s no worry about the settlement period as the money doesn’t move out of the fund house. When you switch from a scheme in Mutual Fund A to another scheme in Mutual Fund B, it’s like selling your investments in one fund and re investing in another. You can apply for redemption from the first Mutual Fund and wait till you receive the proceeds in your bank account. Exit loads and tax implications must be considered while redeeming your investments. Fill up the application form of the Mutual Fund where you wish to reinvest the proceeds once you receive the credits from the first fund. You can also seek help from fund advisors in choosing the right funds for a switch.